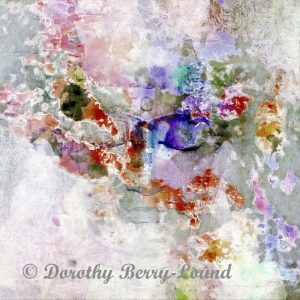 One area of my online gallery ‘Red’s Imaginarium’ is devoted to healing art in particular, but in reality all of my work is designed to impart positive energy and enhance the ambience of wherever it is hung. My piece ‘Mind in Meditation‘ is a good example of my work in this area. The image aims to capture the peace and tranquility, calm and stillness of the meditative state. This piece was given a Special Merit Award in the Light Space & Time “All Women” Art Exhibition competition in January 2018. I have published various articles on how to create healing art including the selection and use of colour in Art for Health . This interest in the healing power of art extends into all my work. So, for example, if I am working on an image of a local Italian town I will apply colours and textures to enhance the mood of the piece. One of my images was accepted into The Foundation for Photo/Art in Hospitals. Called ‘Tranquility Discovered‘ you can see it here at the Kyogle Memorial Hospital in Australia (the image in the centre). It has also been selected for the Careggi Hospital in Florence, St. Paul Minnesota, Tanzania, and Ethiopia. 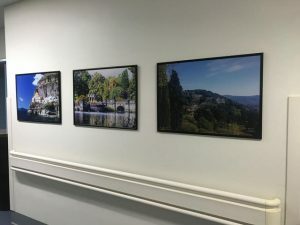 I have six pieces hanging in a doctor’s surgery in Tavernelle in Umbria, Italy. The images I create always have a story, a message I am trying to get across or imagery to make you stop and think. I work from the heart to get across how I feel about the image. This is part of my work as a visual storyteller. My work can contribute to the balance and harmony of the room in which it is hung. For example, the home, office, waiting room, treatment room or spa. This YouTube video provides an introduction to this aspect of my work and tells the story of my Tree Layers Collection with my own poetic narration. It is perfection…the words, your accent, the music and of course, the images! So touching and beautifully and lovingly expressed! Dorothy, you’ve deeply engaged us in the tale of the tree, and the art you created in response. You’ve woven it all together with your healing voice, in a beautifully presented story that is short, sweet, and meaningful! If more people started their days listening to your video and similar, I believe the world would be a happier place generally! Follow me on Facebook, Twitter, YouTube and Instagram. I have a blog that I post to several times a week. Follow my Twitter feed to see my latest work. If you would like to commission a piece please get in touch using the contact form.